c.Net profit of INR 5 Crore or more. In the first 3 years of implementation of this law, over 29000 companies have come under the CSR ambit. Cumulatively they have spent over INR 41,396 Crore over a period of 3 years. In this report, we have analysed the cumulative 3-year sector-wise CSR spend by the entire set of companies (total of 29190), using the data made available by the Ministry of Corporate Affairs as of January 2019. Education is the most popular choice of sector for CSR projects receiving 25% of the total CSR -more than 10,000 Crore -between 2014-2017. In fact education alone received as much funding as the next 2 sectors –healthcare and rural development –combined! 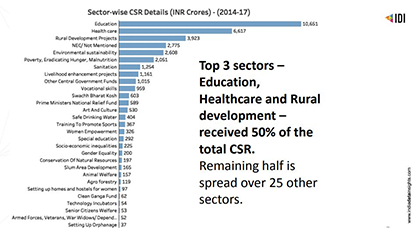 The top 3 sectors comprising of education, healthcare and rural development together received 50% of the total CSR fund. Remaining 50% is spread over 25 different sectors. You can find our data on the sector-wise trends here. Part 1 of our blog, on CSR Compliance, in this series is available here. Part 2 of our blog, on Region-wise CSR analysis, in this series is available here. Part 3 of our blog, on Industry-wise CSR analysis, in this series is available here.